Pray for the hero Dr. Abu Zaid Dorda because he presently is quite unwell. IMAGE ABOVE: the Puppet Western Government assigned to Libya. Ali Qatrani announced his suspension from the ‘Presidential Council of the Government of reconciliation’ announcing that he and a group of deputies were decided in a desolution of the puppet (so-termed) ‘government’. Under the puppet-state, Ali Qatrani would have headed Eastern Libya. Fayez OS up suddenly after Algeria that left yesterday Abdul Hakim Belhaj. Minister of State Omar Black statement on the suspension of his membership of the ‘Presidential Council on National Reconciliation Government’. EU puts Libyan file under the agenda of the foreign ministers for tomorrow in Brussels. Tunisian gate being asked: treatment and only Siraj? . Break into the Residence Hotel, which meets its customers by the ‘OS’ government to show Tunisian demonstrators and security intervenes. The ‘OS’ puppet Libyan government will pay compensation to the text million Movenpick Hotel Tunisian against the destruction of the video recorded by surveillance cameras in the hotel that appears clashes Libyan activists fist and tearing clothes Aallfez Bkalamat obscene. The hotel Ghemari Ramadan‘s lawyer said: “We do not Neptz Libyan government but we feel that this is a good compensation for what happened to our hotel by this Acharazm” ..
Scandals inventories against Tunisia Hotels. ‘Room Zintan operations’ a ajouté 2 new photos. Are you aware of this and what to do in the government hotel? And what it relates to the Brotherhood and the fighter? And what is the reason they burned his home in Tripoli and stole all of the contents of his house? And why is he wanted by the Brotherhood and the fighter? His name is trading between the militias? Is Brotherhood scheming to liquidate their children !!! ‘OS’ is opersting out of TUNISIA !!! Winner OS (puppet Western Government imposed upon Libya by UNO /NATO) Prime Minister al-Toaafikh being threatened by militias of CORNER and even Misurata !!! Ahdhiro client Fawzia Ferjany it is a new project Huda Ben Amer, one of the characters that you configure its own recently rounded up and the raid or arrest anyone who opposes its dirt. She and her husband “Faraj Mahdoa” where recently giving orders to capture the media ‘Badr al-Ralake al-Akora’. Image includes Fawzia Ferjany Bzaivh girl Humaid. Number of illegal immigrants and expatriate without probative exceeded the possibilities of illegal immigration device leaves the employment of all citizens, we hope to provide humanitarian aid to the crumbs to the pending deportation to their home countries. Ali power outages in several areas of the capital Tripoli. Continued power cuts to most areas of the capital. Interruption of electricity to the city of Tripoli lasted for more than five hours. Citizen has been kidnapped, ‘Hamed Saleh Garin’, after Friday prayers. He is from Sabha and had a friend with him also from the south.They found his car and his cell after the bridge of Sawani. ‘Directorates support the security of the western region and the southern power of the Commission, “the 200” ‘ a ajouté 4 new photos. Delivery of a stolen car from the ocean company, type (Miche Knot-weaving) dated 03/04/2014 / Tripoli, ‘Omar Ahmed Abolkasem. The militias of Alklla Gianni Gneoh (el-MAHDI HARATINE) B.Mayormat kidnapping and Islamic identity neighborhood area. Melcaat on alert in the capital, especially Abu Salim. An explosion in one of the generators in the neighborhood area of ABU SALIM ‘victory’. Vote lead hear a little while ago in the ‘Friday Market 11 July’. Found dead commander Mlessxia deterrence client Colonel Nas al-Ssahela’ in ‘Ain Zara’ area. He was been missing for more than two months. Sabriyah clashes area and news of the death of the offender al-Guendh. Martyr, Allah willing, ‘Riyad Mansour Mohiuddin al-Cavala’ .. I could not find the words and the position of non-lived Khoi Obouhvevh Aìal-Zintani Martyr Day with martyrdom and this short video for a serious poet words heartened in the right Habib was always a man ..
Before the battle of the intersection (hamlet), who was martyred in Allah’s mercy ..
And we went and cited ‘Riad’, Allah’s mercy and captured his spirit and is mentioned certificates and tells us to defend the Zintan and its people without any penalty and no thanks. Take some rifles and say it to my uncle or my uncle Khalifa spears al-Sakali I do not recall the name identifying it as the secretariat Amana Zintan in Arkabkm .. Blessed are those who Nansabhm our death when Allah of the martyrs and to Allah the blood of these men Manbzl King of the whole world. Access internal interim government minister to the city of ZINTAN. We arrived to the city of Zintan Friday, Minister of Interior and Labour and Social Affairs and the President of the Transportation Authority in the interim government. Members of the campaign (us hope) are visiting the city of Zintan and lecture awareness of male and female students in the Faculty of Science. Arab Women Libyan After that enabled First of September Great Torre from the site of Assistant Secretary of the General People’s Congress, and secretariats of Information and Culture and the administrative control of the General People’s Committee, and site Assistant Secretary and Women’s Affairs in all the Basic People’s Congresses and Balhobeiat popular committees, and other sites decision and implementation. ‘Zintan operations room’ a ajouté 3 new photos. Opened yesterday the headquarters of the Criminal Investigation Municipal apparent Yafran (Aghannaimh) the efforts of the sons of the security establishment and the people of the region to park them after assigning an official commissioned by the interim government hailed existing ‘Bhdh Foundation special forces’ to storm the destructive phenomenas and foil any terrorist attempts. There is the power of arrest and investigate and there are anti-terrorism forces. Saluting downloaded bids around the intrusion and capture, and also cars from martial arts. Visit the ‘interior minister in the interim government’ to the Municipality of al-Rajaban. arrest of an armed group broke into the Department of Obstetrics and Gynecology Hospital GHARYAN. Zintan & Kklhalcil al-Askara al-Zintan..
seetm signing tomorrow or the day after tomorrow between Zintan and Kikla and the exchange of detainees between the two parties agreed on a neutral force, a force of steady until the establishment of security. and pledge not to capture identity and respect for the rights of the neighborhood and the return of residents to their homes and their property. Today was the final signing between the towns of Zintan and Kikla. In a good sign of good and righteous people about the fact that a comprehensive reconciliation to pervade the whole of the mountain and back, God willing, as was best. The last will not be until all the displaced return to his home and his livelihood and his home. If you do not have what you are saying, then say good or Feltsamt. And sedition dormant cursed God of Oiqdha. We ask Allah to security and safety prevail over the country and to end the suffering of the people Walibi. Vhbabikm worth what is better than war and fighting. The withdrawal of the joint force of Kikla last night Tida to the terms of the agreement with the elders Kikla. ‘Melcaat al-Nmra’ arrested 20 people in front of a car market at a resort area. and the ‘region’s youth Asdonhm’ and the exchange of heavy fire between the two parties Lord Lester. Close dirt road barriers Khatatba in area Sabratha. This morning in a military plane landed at Misurata airport, coming from Turkey. The withdrawal of militias from the gates after receiving news of the entry elements with members of the city’s potential for explosions within the city. within the bank and the bank was heavily crowded, where the police beat one bullet inside the bank to High bullet slammed against the wall, causing the re-entry to settle at the top of one of the citizens. starting bearer of ‘U.S. aircraft’ stationed within the territorial waters of the Libyan bombing of sites in the city of Sirte in preparation for the landing ground forces. ‘Daash’ terrorist organization in Sirte, being limited to the population of public buildings in order to claim apartment owners to pay a premium and only be pulled and allocated to another citizen. ‘Daash’ terrorist organization has to suspend ‘Mamed Amr al-Razali’ for 3 three hours in the city square with the words and wrote false witness against him. Attention guy sitting neighborhood. ‘Daash’ terrorist organization to evacuate the gate Ibn Sina hospital urgently of terrorist elements to see three armed vehicles of ‘DAASH’ give up the gate and heading towards Halls complex and Acadouko. Elements ‘Daash’ terrorist organization waging a campaign of raids and arrests of sync last night in the cities of Sirte, the suburb of BATON, and Bin Jawad; and abducted many of the young people mentioned areas. The raids began at 2 campaign after midnight and the terrorist elements broke into the houses suddenly without asking the permission of its population, in the anxiety of children and women as they slept. SUICIDE Explosive belts which were in Hozat Kharijites in front Port Sidra .. The Child ‘Mohammed Zawawi’, was wounded by shrapnel as a result of the suicide bombing carried out by the terrorist organization ‘Daash’ during his attack on the eastern gate of Ras Lanauf. Selfie red Hamada gathering rat-informers. Ncov my first time more powerful than the rats’ Prime Minister’s Council. (rats ‘Municipal Council’ under orders from NATO, expelled the CASABLANCA / TOBRUK government). Giving the TOBRUK government 24 hours to leave!!! Dr. Abdul Salam al-Badri, Deputy Prime Minister of the ‘OS’ interim government leaves CASABLANCA, after threatening to kill him …. To storm the headquarters of the body drafting the constitution in CASABLANCA (under Ali Tarhouni) of the central support and force residents and city employees stripped of their cars and personal purposes. Again the ‘National Commercial Bank branch in Tobruk’ experiences congestion; because, Arabism Street shut by protesters in CASABLANCA protest against the deterioration of the situation and demands by NATO clients for employees to leave the TOBRUK government, because it did not provide liquidity in banks. The escape of members of the Tobruk ‘Majlis al-Nuwaab’ interim government to Qrnadh area last night and slept in dormitories inside the mobile camp next to the prison after being expelled from CASABLANCA. The killing of a leading rat ‘Shura Council Tawar’ of Benghazi ‘Daash’, ‘Yousef al-Jml, by the hands of the Libyan Army under General Hftar. Hvevh al-Sartaoa, one rebel of ‘Nakba 17 February’, was killed today in the city of Benghazi. Today the market of the Republic Bank branch clouds LD 300 ceiling and of course the whole dinars and who arranged Manzlh plotting his head. Talat great old age crying is suspended Shi into account. She said: Ray and rent expense Girls. Suffice God and yes, the agent in of the reason. Leaflets found at the al-Fateh University. Two hours and Bnmsha !!! shrugged their chilling training of suicide bombers and sending messages to their camps to seek-out and destroy the Libyan Army, and renew their allegiance to ‘Baghdadi’ (Simon Elliott). I think that this version by ‘Daash’ today, is the best gift given to us by the organization. It is clear-cut, and removes all doubt and proves that there is a fight in all axes in Benghazi. The video explains to us that DAASH uses Kharijites (foreigners) to carry out suicide operations. Bearing all those who say that the Libyan Army fights (so-termed) ‘rebels’ in Benghazi, are less described as a tragic error of judgement. Let’s stand today, following the news bulletins channel and panorama, and advising them how ‘Sasmon’ in Benghazi are fighters from ‘Ansar al-Baghdadi’ (‘ANSAR al-SHARIA’), according to the ‘Islamic State’ of this release. The question here, is where they are ? if Thoarkm in Benghazi !!! The fall of the shell deliberate before sunset prayers at a ‘mosque Qur’anic Center, Ms. Hafsa’ popular. The arrival of a relief convoy to the headquarters of the Libyan Relief Commission Thursday evening loaded with Hawally 1,000 tons of food based on the agreement between the Libyan Authority and the Food of the United Nations .seetm on Monday the distribution of these substances under the food basket for each family of the prisoners displaced, according to the data in the body Base. and all the people out of their homes, especially in the vicinity of the blast site areas. Cut columns and theft of electricity cables brass on the road in the al-Jufra area of Allod. Killing one person and injuring seven others, including a child because of renewed clashes… Dead and wounded in the clashes taking place in the city since dawn today between tribes Tuareg and Tabou. And to declare their support for the formation of the Popular Front for the Liberation of Libya and calls on all honest it home Palanzmam. When other objects political manufactured and promoted in the name of Saif such as the taller of the ‘Popular Front for the Liberation of Libya’, this messes and greed for power and charm and split the ranks of Light are free for this warn you of poison in the honey. Ankanwa loving homeland if Olthmwa under the shadow of the conference as the first national achievement Great calculated p Light supporters and who was first assigned in Dr. Saif Islam, ‘Secretary General of the Conference’ when they ignore the fact this means that you are in fantasy and wish yourself in the inauguration of the Championships and several of greed unfortunately. and escape the Astadmt car fence the cemetery, after he was shot, where the gang, by pointing his gun at the owner of the show; but he bravely and Vrsenh heroes to defend his money, rather be shot, and killed one of the gang members and the rest escape like escape mice cornered. Tlat brother suffered from Ubari residents of an armed robbery in the broad street after the withdrawal of salaries of Sabha were shooting them one of the brothers was wounded in the leg and his condition is serious: cut off the artery needs urgent surgery might lose his leg. The second wounded in the thigh and the third his condition is good. Lord saves our brothers in the south. And an agent of the Americans because they are fighting Iran! ‘Room Zintan operations’ a partagé la vidéo de Mohamed el-Daif. Lockerbie Lawyer Ibrahim Ghwell: The West and NATO want to impose a government on Libya to carry-out their demands only. ‘Wanted by Interpol’ Lawyer Ibrahim Ghwell through the life of the Egyptian program today calls for Egypt to benefit from the two million displaced Libyans who are on Egyptian territory and their support in the fight against terrorism that has swept Libya. We note that Mr. Al Ghwell’s article makes no reference to these nuances of Libyan law in this respect. As such we have noted that that Ibrahim Al-Ghwel’s Red Notice was still on the INTERPOL site as of 5 June 2015. Seemingly suspended but not canceled. Confirming this on the 20th of May 2015 on Al Nabaa television channel, Siddek Al Sour, the Head of the Investigation Department for the Libyan General Prosecutors Office in Tripoli said of the Libya’s INTERPOL Red Notices, The Red Notices were not canceled, they are still in effect. Tobruk just froze them. On 24th of July 2015, we questioned if all Interpol notices had been cancelled. On the 27 July 2015, Libya Al Mostakbal reported that it was NOT officially suspended/cancelled – meaning as per Libyan law and within THEIR PORTFOLIO, the Prosecutor’s office had NOT requested their suspension/cancellation. Rather, Mr. Al Sour suggested that non-payment may have removed the INTERPOL RED NOTICES. Finally, we reiterate again under Libyan Law the Minister of Justice does not supervise the Libyan Judiciary or the Prosecutor’s office and the INTERPOL red notices are not within his portfolio. Rather, the INTERPOL Red Notices –per Libyan Law – were within the portfolio of the Investigation Department for Libyan General Prosecutor’s office. Therefore, without the Investigation Department for Libyan General Prosecutor’s office request to suspend or cancel the Red Notices – which Mr. Al Sour did not give – the Minister of Justice’s letter is just a letter – as per Libyan Law. Finally, the relevant update to this article is that it seems that Mr. al- Ghwell has left The World Bank and Mr. al-Ghwell’s 31 May 2015 tweet. We think this says it all. ‪#‎Libya‬ needs to issue a general ‪#‎amnesty‬ to all those who supported ‪#‎Gaddafi‬ & needs it NOW ….. 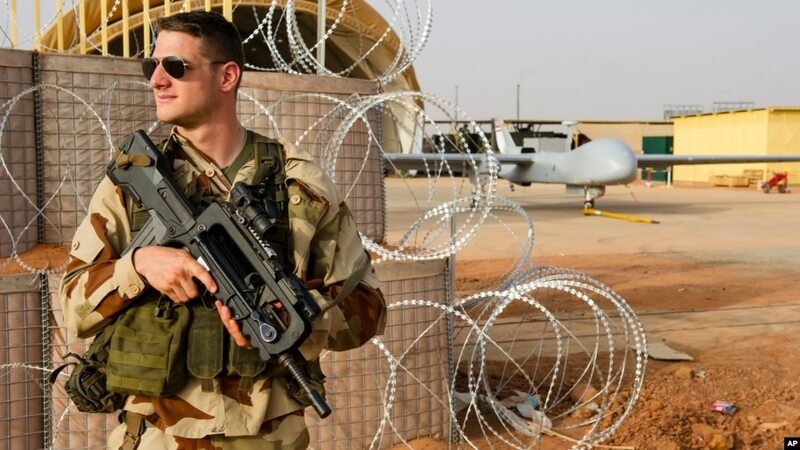 FILE – A French air force soldier on guard near a Hartford drone, at the Niamey military base, in Niger. PARIS—France is setting up a base in northern Niger as part of an operation aimed at stopping al-Qaida-linked militants from crisscrossing the Sahel-Sahara region between southern Libya and Mauritania, officials said. Paris, which has led efforts to push back Islamists in the region since intervening in its former colony Mali last year, redeployed troops across West Africa earlier this year to form a counter-terrorism force. Under the new plan, about 3,000 French troops are now operating out of Mali, Burkina Faso, Niger and Chad – countries straddling the vast arid Sahel band – with the aim of stamping out Islamist fighters across the region. Another 1,000 soldiers are providing logistical support in Gabon and Senegal. “A base is being set up in northern Niger with the throbbing headache of Libya in mind,” a French diplomat said. Neither France nor Niger has said where the base will be but military sources in Niger said it was likely to be around Madama, a remote desert outpost in the northeast, where Niger already has some troops based. French officials have repeated for several months they are concerned by events in Libya, warning that the political void in the north is creating favourable conditions for Islamist groups to regroup in the barren south of the country. Diplomatic sources estimate about 300 fighters linked to al-Qaida’s North African arm AQIM, including a splinter group formed by veteran Islamist commander Mokhtar Belmokhtar, are operating in southern Libya, a key point on smuggling and trafficking routes across the region. French and American drones are already operating out of Niger’s capital Niamey. Echoing the French push to get assets closer to Libya, U.S. officials said last month that the United States was preparing to possibly redeploy its drones to Agadez, some 750 km (460 miles) to the northeast. Three years after they launched airstrikes to help topple the Great Jamahiriya, Western powers including France have ruled out military intervention in Libya, fearing that it could further destabilize the situation given that countries across the region are backing different political and armed groups in Libya. However, with France particularly exposed in the Sahel-Sahara region and its forces now engaged in a support role against Islamic State militants in Iraq, Paris is stepping up efforts to squeeze militants in the area. The murder of a French citizen last week in neighboring Algeria by former AQIM militants who pledged allegiance to Islamic State also appears to have toughened Paris’ resolve. The French operation, dubbed Barkhane after the name of a kind of sand dune formed by desert winds, has set up its headquarters in the Chadian capital N’Djamena, but also placed an outpost in northern Chad about 200 km from the Libyan border. Jaron said the new Niger base was still being finalized, but would have capacity for as many as 200 soldiers with aerial support. “The aim is to bring together areas that interest us. The transit points which terrorists are likely to use,” he said. There have been some successes in recent weeks. Two diplomatic sources said Abou Aassim El-Mouhajir, a spokesman for Belmokhtar’s “Those Who Sign in Blood” brigade, was captured by French troops in August. French media said he had been taken in Niger. Niger intelligence sources said French troops had passed through Madama around the time of the operation. Jaron said four suspected militants were also captured on Sept. 24 near Gao in northern Mali, where France has handed the bulk of security control to U.N. MINUSMA peacekeeping forces. At the same time there has been an increase in attacks on foreign troops in Mali, including the death of 10 Chadian soldiers in September. The U.N.’s peacekeeping chief, Herve Ladsous, said last week that with many French troops leaving the north of Mali, U.N. forces were being targeted and finding it difficult to respond due to a lack of helicopters and special forces. “It’s a problem that is being resolved. We want the MINUSMA to be up to scratch so we can focus on our number one job: getting rid of AQIM,” said a French defence ministry source. France in early OCTOBER 2014 created a French base on the ground directly upon the Libyan border with Niger. –Most of the interest centers on a piece of land in Northern Chad called the Aouzou Strip which is rich in uranium and other rare minerals. the GREAT JAMAHIRIYA formed an alliance with the government of Goukouni Wedeye who allowed some Libyans to occupy the strip; but in 1982 Wedeye was overthrown by Hissene Habre who was backed by the CIA and by French troops. “Under President Reagan, the United States gave covert CIA paramilitary support to help install Habre in order, according to secretary of state, Alexander Haig, to ‘bloody Gadafi’s nose’”. Bob Woodward wrote in Veil that the Chadian coup was William Casey’s first covert operation as head of the CIA. During the years following Habre’s coup, the People’s Army of the Great Jamahiriya (seeing what was happening just below their border) decided they could not just stand-by and watch the slaughter continue by the forces of the Chad government, the Yankees’ intervention and support of Habre, the evil CIA and French intelligence. Repeated clashes with Chad/American Forces were inevitable. In March 1987, a volunteer force of some 600-700 Libyan soldiers, under the command of General Khalifa Hftar was captured and imprisoned. In 1990 French troops helped to oust Habre and installed Idriss Debry to replace him, after François Mitterend had Mu’ammar al-Qathafi negotiate a treaty with Chad. According to one account, the French had grown weary of Habre’s genocidal policies while the new resident in the White House, George H W Bush did not have the same interest as Reagan had in using Chad as a proxy to damage Mu’ammar al-Qathafi (even though the Libyan leader formed an alliance and sound treaty with Debry). Following the fall of Habre, Mu’ammar al-Qathafi, in his treaty, firmly demanded that the new government hand over Hftar’s men… But, instead Debry allowed the Americans to fly them to Zaire. There Libyan officials were given access to the men and about half agreed to return to Libya. When US financial aid offered to Zaire for giving ‘the rebels’ refuge failed to materialise, they were expelled and sent to Kenya. Eventually the Kenyans said the men were no longer welcome and the United States agreed to bring them to America where they were admitted to the US refugee programme. A State Department spokesman said the men would have “access to normal resettlement assistance, including English-language and vocational training and, if necessary, financial and medical assistance.” According to one report the remnants of Hftar’s Army were dispersed to all fifty states. These remaining ‘Libyans’ were ‘conditioned’ by American personel (brainwashed) and bribed into working for the USA, where they would be trained to overthrow the GREAT JAMHIRIYA. It was the arrest of the lawyer representing many of the prisoners’ families that the CIA used to spark the ’17 February /CIA / NATO uprising against the GREAT JAMAHIRIYA, and in particular, AGAINST Mu’ammar al-Qathafi, and with it, the return of Khalifa Hftar, [whom the CIA did not know, had already reconciled with Mu’ammar al-Qathafi…and who was happy to work (undercover) with General al-Fateh Younis, to help stop the West’s immoral plans against the Great Jamahiriya]. *2: the following is heavily edited from JON LEE ANDERSON (23 FEBR. 2015). Hftar, who is a mild-looking man in his early seventies, has fought with and against nearly every significant faction in the country’s conflicts, leading to a reputation for unrivalled military experience and for a highly flexible sense of personal allegiance. In the Green Mountains of Cyrenaica, the country’s traditional hideout for ‘rebels’ (extremist Wahhabi factions) and insurgents, he established a military headquarters, inside an old airbase surrounded by red-earth farmland and groves of hazelnut and olive trees. Hftar’s force, which is the Libyan National Army, has successfully taken much of the eastern half of the country, in a defensive move, as well as an ‘offensive’, known as ‘Operation Dignity’. Hftar’s army is composed mainly of ‘Great Jamahiriya’-era soldiers and federalists seeking greater autonomy for the eastern region of Cyrenaica, mixed with tribal fighters from the west and the south. … Much as (Egypt’s President) General Abdel Fattah el-Sisi has boasted of doing in Egypt, General Hftar proposes to destroy the Islamist forces and bring peace and stability—enforced by the new Libyan Army and its supporters. When I visited Hftar’s base, earlier this winter, I passed a Russian-made helicopter gunship and was greeted by a group of fighters unloading ammo. The base was in a state of constant alert. Hftar is a top-priority assassination target for ‘Dawn Libya’s militias’. ‘Dawn Libya’, is a loose coalition of the MISURATA ‘Brotherhood’ militias, many of them working in a tactical alliance with Wahhabi extremists. The USA has boasted a price upon his head, and last June, a suicide bomber exploded a Jeep outside his home near Benghazi, killing four guards but missing the primary target. Now there is heavy security around Haftar at all times. At his base, soldiers frisk visitors and confiscate weapons. A few months ago, someone reportedly attempted to kill him with an explosive device concealed in a phone, and so his men collect phones, too. In a deliberate voice, he told me why he had gone back to war. Hftar tried to find a place for himself in the ‘new’ Libya. All the while, he watched as Libya floundered under a succession of weak governments, and the country’s militias grew more powerful. Last summer, Wahhabi extremists moved to seize Benghazi; in a merciless campaign aimed at the remains of civil society, assassins killed some two hundred and seventy lawyers, judges, activists, military officers, and policemen—including some of Hftar’s old friends and military colleagues. There is no overstating the chaos of post-GREAT JAMAHITRIYA Libya. Two competing governments claim ‘legitimacy’. Armed militias roam the streets. The electricity is frequently out of service, and most business is at a standstill; revenues from oil, the country’s greatest asset, have dwindled by more than ninety per cent. Some three thousand people have been killed by fighting in the past year, and nearly a third of the country’s population has fled across the border to Tunisia. The downfall was encouraged by NATO air strikes—and has become a tyranny of ‘a dangerous and pervasive instability’. For Hftar, the east was the obvious place to begin his offensive. “Benghazi was the main stronghold of terrorism in Libya, so we started there,” he said. An old Libyan maxim holds that everything of importance happens in Benghazi. In 1937, Benito Mussolini came there to solidify his colonial power. In 1951, the newly crowned Western puppet-King Idris I, broadcast a radio address from the city to proclaim ‘Libya independent’ (HOW HYPOCRITICAL !!). When the ‘Young Libyan Officer’s Movement’ began their REVOLUTION against the monarchy, he was a young officer based in Benghazi. Lévy said that he returned to Paris and told President Nicolas Sarkozy that (so-called) ‘humanitarian intervention’ wasn’t enough. “The real objective had to be to topple Qaddafi,” he told me. Sarkozy agreed, and Lévy became his emissary. Lévy accompanied a Libyan opposition leader to meet Secretary of State Hillary Clinton, to lobby for U.S. involvement. * “It was hard to convince the Americans,” he said. “Robert Gates was totally opposed…. But Hillary got it,” [as she was pressing for a Western-Zionist Bank controlled North African corridor, of which (she) pre-conceived the success of such, with the ‘Muslim’ Brotherhood ruling the region, through a CIA-MI6 sponsored ‘Arab Spring’]. On 20 October 2011, after nine months of fighting, a group of ‘thuwar—battle-hardened ‘Muslim’ Brotherhood Wahhabi ‘militiamen’—from the port city of Misurata, and another group of Misurati militiamen, massacred sixty-six of The Great Jamahirya‘s last military loyalists in the garden of a Sirte hotel, after they video-taped themselves tormenting their green captives. It had been clear from the start that the militias were going to be a deeply troublesome feature of post-Great Jamahiriya Libya. The ‘rebel alliance’ was hastily thrown together from many disparate groups—some friendly to Western ideals and others driven by Wahhabi dreams of a new caliphate. Even as Western governments deliberated over whether to support the (so-termed) ‘rebels’, Wahhabi from the eastern city of Derna emerged as a force on the battlefield. In an ugly episode in July, 2011, the (so-called) ‘rebel coalition’ ’s military commander, General Abdel Fattah Younes, was abducted, tortured and grizzley-murdered, through the orders of the infiltrated CIA-agent (who was the Great Jamhiriya’s last chief Justice), Mustafa Abdel Jalil, seeking revenge for Younes’s persecution of them when Younes was the Great Jamahiriya’s interior minister, and also the revelation that Younes was a double-Agent, working for the Great Jamahiriya with a secret contract with Mu’ammar al-Qathafi. The MISURATA militias raced to occupy key positions in Tripoli. The militias ransacked the Great Jamahiriya’s well-stocked armories, and the Misurati made off with hundreds of Russian-made tanks. The Zintani, who always were the Security force for the TRIPOLI INTERNATIONAL AIRPORT, re-took over the international airport, under supervision and blessings of General Khamis Gaddafi. But other armed WAHHABI groups also seized positions for themselves. In July, 2012, the Western ‘Friends of Libya’ met in Paris and created for Libya, a national assembly called the General National Congress: A loose consortium of (so-termed) ‘liberal and centrist parties’ affiliated with the ‘Muslim’ Brotherhood. The GNC backed the militias. Indeed, Libya’s tens of thousands of thuwar became increasingly powerful: rather than finding the fighters jobs and forcing them to disarm, the government put them on the state payroll. Frederic Wehrey, a Libya analyst at the Carnegie Endowment for International Peace, told me, “Probably only about a third of the militiamen actually fought in the war. The problem is that when the government started funding them it created more and more of them. No records were ever kept, so people were double- and triple-dipping.” Westerners started to come under attack with troubling frequency. In January, 2013, gunmen in Benghazi fired on an Italian diplomat’s car, but he emerged unharmed. In April, a car bomb, claimed by al-Qaeda in the Islamic Maghreb, severely damaged the French Embassy in Tripoli. Although the Wahhabi-Brotherhood had lost at the polls, they found a way to assert political power. In May, they urged the G.N.C. to pass a law banning virtually everyone who had participated in The Great Jamahiriya from holding public office. During the vote, armed militiamen stormed government ministries to demand the law’s passage. The immediate effect was to neutralize several of the Wahhabiis’ key rivals, mostly political ‘moderates and technocrats’ who had served at the end of the final years of the GREAT JAMAHIRIYA. The speaker of the G.N.C. was obliged to resign. In December, 2013, the G.N.C. endorsed a Wahhabi corrupted version of ‘Sharia law’ as the source of all legislation and voted to extend its mandate for an additional year. Hftar watched the country’s decline with growing anger. On 14 February 2014, he appeared on television to announce the unilateral dissolution of their (so-called) ‘parliament’ and the creation of a “Presidential committee” and cabinet, which would govern until new elections could be held. His move had the hallmarks of a coup, yet Hftar had no apparent way to enforce it, and he was publicly taunted for his hubris. But Hftar had a strategy. He had embarked on a series of “town hall” meetings around the country, while he secretly built-up an army, with the support of old Great Jamahiriya comrades from the military and the Xanthan forces of Zintan.. In May, he launched ‘Operation Dignity’, with attacks against the ‘Muslim’ Brotherhood Wahhabi militias in Benghazi, which he said were intended to “eliminate extremist terrorist groups” in Libya. Not long afterward, his forces in alliance with Zintan, occupied and smothered the Allaotunai Conference (of the GNC)‘s al-RIXOS building in Tripoli. Hftar’s offensive resonated with many Libyans, who had grown frustrated with the G.N.C. and thecorruption, thievery and violence that had flourished during its rule. Then came a minority election, and there appeared a new legislative body, the ‘MAJLIS al-Nuwaab’ (‘COUNCIL of DEPUTIES’) who rejected the Misurata ‘Muslim’ Brotherhood rule. Te ‘Misurata ‘Muslim’ Brotherhood performed poorly in the elections, in June, but, before the new parliament could take office, the Wahhabi, strengthened by militiamen from Misurata (inder Salah Badi), attacked and destroyed a good portion of the residences in Tripoli, and to boot, Tripoli’s international airport was taken by trickery (of a false agreement, immediately broken by ‘Dawn Libya’), in their horrendous attempt to seize it from the Zintani Security who backed General Hftar. The airport, including one and a half billion dollars’ worth of aircraft, was destroyed, and hundreds of Zintani fighters were killed. With Tripoli a battlefield, the U.S. pulled out of Libya entirely, moving its Embassy to Malta, separated from the besieged capital by two hundred miles of water. With the fighting in Tripoli, two opposing armies took shape. The group aligned against Hftar, under Salah Badi, called themselves ‘Dawn Libya’. ‘Dawn Libya’ is an uneasy coalition; it includes former al-Qaeda terrorists who fought against the Great Jamahiriya in the nineties, Amazigh ethnic militias, members of Libya’s branch of the ‘Muslim’ Brotherhood, and a network of Zionist merchants from Misurata, whose fighters make up the largest block of Dawn Libya’s forces, and were reponsible for the November 2013 Massacre at Gharghour (TRIPOLI). Finally, in late last August 2014,’Dawn Libya’ took control of Tripoli, effectively dividing the country into east and west. The Wahhabi-Brotherhood who had lost power to the newly created ‘MAJLIS al-Nuwaab’ (Council of Deputies) insisted that the G.N.C. was the country’s only legitimate government. With the country increasingly unstable, the H.O.R. established itself in the city of Tobruk, eight hundred miles to the east. There, the ‘elected’ members proclaimed themselves Libya’s “true government”—even as they retreated for a time to a Greek car ferry moored offshore. As the standoff worsens, regional powers have stepped in. Hftar’s ‘Libyan Army and airforce’ (recognised by the offiial state ‘Majlis al-Nuwaab’) reportedly receives weapons and financing from Egypt, led by the vehemently anti-Wahhabi / Brotherhood, president General Sisi and from Russia. ‘Dawn Libya’ is backed by Qatar, Sudan and Turkey, which support the ‘Muslim’ Brotherhood. Their involvement has given the conflict the dimensions of a proxy war. The regional implications of Libya’s breakdown are vast. The southern desert offers unguarded crossings into Algeria, Niger, Chad, and Sudan, where armed bands—including human traffickers and (so-called) ‘jihadists’ from al-Qaeda in the Islamic Maghreb—roam freely in four-wheel-drive convoys. Huge numbers of migrants, mostly Africans but also some Middle Easterners, are being smuggled through Libya. At the Mediterranean coast, they are placed in overcrowded boats and pointed toward Italy, where the fortunate ones are picked up by the coast guard or by passing cargo ships. Last year, the number of migrants reaching Italy in this fashion rose to a hundred and seventy thousand; more than three thousand are believed to have drowned at sea. In early February, another three hundred died. The ‘Muslim Brotherhood’ and the Misratan leaders support the growing extremist elements which remains active on the battlefield. They send bulldozers to Benghazi loaded with weaponry and ammunition and mercenaries. In Benghazi, where Hftar’s soldiers have been fighting the Wahhabi groups for control, the combat has caused widespread destruction and a steady stream of casualties. Hftar claims to hold most of the city, though he says that snipers have slowed his advance. The main enemy is ‘Ansar al-Sharia’, the group implicated in Stevens’s death and widely suspected of leading the assassination campaign that devastated civil society in Benghazi. In late January, Mohamed al-Zahawi, the leader of Ansar, died from wounds suffered in battle, but his forces have kept fighting. After the overthrow of the ‘Great Jamahiriya’, hundreds of fighters from Derna, a city long associated with Wahhabi extremism, travelled to Syria to join the war against President Bashar al-Assad. Many fought alongside ‘Jabhat al-Nusra’, the Syrian affiliate of al-Qaeda, and some joined DAASH. In recent months, a sizable number have reportedly returned ‘home’ (along with many world mercenaries) in order to fight against Hftar’s forces. In October, a Derna-based (so-called9 ‘jihadist group’ declared its allegiance to DAASH, and, a few months later, another DAASH unit claimed responsibility for the execution of a dozen Libyan soldiers. In an audacious daylight assault in late January, a third group of DAASH gunmen raided the Corinthia, a five-star hotel in downtown Tripoli, killing at least eight people. A few weeks later, DAASH took over a village near the coastal town of ‘Bin Jawad’. Hftar says that he intends to take on Derna’s extremists once he has conquered Benghazi. “We will use all the means at our disposal to exterminate them,” he assured me. Hftar’s Libyan Army possesses a small air force—an advantage he holds over ‘Dawn Libya’, which has only a few Sudanese and Turkish aircraft—and every few days his fleet of vintage MIGs carries out bombing sorties over Benghazi, or, farther afield, in Ajdabiya, Misurata, Sirte, and Tripoli. Hftar said that he planned to bring the war to Tripoli, and to Misurata, but dismissed the possibility of widespread carnage. “Tripoli will be overrun quickly, because the people will rise up, and we have forces inside the city,” he said. Benjamin Rhodes, the U.S. deputy national-security adviser and a close confidant of Obama, noted that there has also been occasional military action. Last June, Delta Force operatives abducted Ahmed Abu Khattala, an ‘Ansar’ member who is suspected of leading the attack that killed Ambassador Stevens. Khattala is now (deceased) was awaiting trial in the U.S.
Rhodes was one of the aides who, along with Clinton, Susan Rice, and Samantha Power, helped persuade Obama to join the intervention. In spite of the chaos that followed, Obama stands by that decision. Unlike many other cities and towns in Libya, Tripoli presented an image of normality. Traffic flowed, and groups of young men wearing Italian sportswear hung out drinking coffee from paper cups. Here and there, at government ministry compounds, I saw groups of bearded men with guns, but none of the tanks and battlewagons that had traversed the capital after Tripoli’s 23 August 2011 ‘fall’. Yet Tripoli’s air of calm belied an underlying tension that was evident as soon as I came into contact with the men who were running things. Until 2005, he claimed, Hftar’s family had received an annual stipend of two hundred thousand dollars from the GREAT JAMAHIRIYA—“You can go on YouTube.” (Hftar has acknowledged that, as a former P.O.W., he got a stipend from the GREAT JAMAHIRIYA, but says that it ended in 1993.) More recently, Zubia said, Hftar had “come to Tripoli and tried to form a Brigade, but failed.” And, he added, one of Haftar’s sons had been wounded. (In fact, Hftar’s son, Saddam, was said to have been shot by a Zintani Bank Security Forceman.) Zubia described Hftar and his family as a kind of criminal enterprise. [all propaganda LIES] “I ask you to use your intelligence,” he said. Indisputable information is difficult to come by in Libya. Everyone feverishly monitors Web sites where pictures are posted and things proclaimed and discussed, but most of what passes for news is political propaganda, pure and simple. ‘Dignity’ has a TV station, which broadcasts footage of Hftar on inspection tours of the Benghazi battlefield, set to martial music, along with gruesome clips showing the victims of the other side’s violence. ‘Dawn Libya’ has a similar channel, presenting the opposite view of the conflict. Each side discounts the other’s reporting, and, in the absence of news, outrageous gossip is quickly accepted as fact. In a meeting near Benghazi, an economist soberly relayed to me the preposterous claim that Bernard-Henri Lévy had been paid forty million dollars to lobby for the ‘Muslim’ Brotherhood’s interests in Libya. Perhaps the only point of agreement between ‘Dignity’ and ‘Dawn Libya’ is the primacy of oil in the country’s future. A couple of days before I met Hftar, his jets had bombed an armored column from Misurata as it advanced on facilities held by his proxies, and he described the advance as a kind of moral affront. “You will hear of our response in a few days,” he promised. Two weeks later, his MIGs carried out air strikes against Misurata’s airport. Of the Misrati, he added, “If they do anything more than they have already done, they will pay a heavy price.” …Afterward, I spoke with General Mohamed al-Ashtar, a high-ranking ‘Dawn Libya’ commander, who told me that his men were advancing on the oil terminal of Ras Lanuf when they were hit by Hftar’s jets. In order to avoid damage to the facilities, he claimed, he had ordered his troops to withdraw, but now they had Hftar’s men surrounded. “We are waiting for them to answer our conditions so they can withdraw and hand over the facilities,” he said. “What about Hftar?” I asked. As the fighting goes on, the country’s remaining oil money flows through the Central Bank now stationed in MISURATA headquarters, where it is disbursed without discrimination to the MISURATA militias and criminal gangs. Tarhouni spoke matter-of-factly about the events that were reshaping the country, but he smiled rapturously as he told of visiting his home town of Marj (PRAIRIE CITY), not far from Hftar’s base. He had forgotten how ‘green’ it was, he said. After seeing the appalling-results of the puppet-GNC, Ali Tarhouni RESIGNED from his appointment as ‘head of the Assembly’. In early February 2015, representatives of the G.N.C. and the U.N. began new talks in Libya, but Hftar and his military opponents didn’t join them. Many of Hftar’s men welcome the chance for more fighting. I spoke to Colonel Abdul Raziq al-Nadzawi, Haftar’s rough-hewn chief of staff, at a sprawling base outside Tobruk. “Dignity started because our soldiers were being slaughtered and beheaded,” he said. “We had no intention of fighting our brother revolutionaries, but they joined those terrorists, so we had no choice.” Like Hftar, Nadzawi believed that the war would have to be won in Tripoli, but he hoped that civilian casualties could be kept to a minimum, if people fled the city. In a country full of militias and increasingly hospitable to Wahhabi extremists, the LIBYAN ARMY’s offensive may yet provide a small hope for stability. On 22 January 2015, Hftar’s men made a sudden advance in Benghazi, taking over the city’s central-bank branch and most of the port from the Wahhabi insurgents. When I saw Hftar at his base, he had spoken confidently about his plan to “purify the country.” But there was more fighting ahead. The aid from Egypt and Russia has been modest, and, as the LIBYAN ARMY grows, its demands are outstripping supplies. “We are a very rich country,” he reminded me. “We want our people to have good homes, good schools. We had hoped for Libya to be God’s heaven on earth. But we need infrastructure, new buildings, factories. We have oil, gold, uranium, and seas of sand…. The Lebanese al-Mokhttefan in Libya kidnapped a month ago for financial reasons, has nothing to do with their holding our son Hannibal Gaddafi. Clashes between rival al-Melcaat al-Hanih and al-Khaddaroh on Jamal Street. Howitzer in the fall of random street obstacle launched by rival militias in the CORNER. Praise be to God, who is righteous thanks to him, a picture of a meeting of reconciliation and love between Zintan and epiphyseal and reconciliation agreement was hurt in a giant step on the road to peace between the country and the interest of our people ..
Greetings to everyone from the Sahel in this blessed agreement. The city is Free ! A tribute to the free of the CITY of FIVE honorable. a Contact Person for the torture and killing of many of the prisoners in the prison of Tmanh. ‘Daash’ terrorist organization based anti-aircraft gunnery-firing from inside the farm research center, after the air strike that targeted one of their camps in the area west of the city (back a little while ago). Libyan Airforce Warplanes bombed unidentified child-training sites of the organization ‘Daash’ at Farouq camp, in back area west of the city of Sirte. ‘Daash’ organization closes desert road, who graduated from the families of the area from Bin Jawad through to Ras Lanauf area. ‘Daash’ terrorist organization set off a feeder line to the oil tanks Harouj company (‘al-Phippa’) south of the city of Ras Lanauf (30 km). and they will bring in others from abroad for the operation of the oil fields and refineries after their controling plan is feated. ‘Daash’ is taught a lesson in the art of war ..
and cited on the track many live ammunition and alive to this uprising Mu’ammar al-Qathafi launched a name-plaque for each of the ‘martyrs of January ’64’ (having their) names upon one of the educational institutions in Benghazi. al-Atoraly three members of the City of Misurata with their throats slit on the road link between al-Jufra and Shati after scholars gate 100 km from the city of al-Jufra. Preliminary reports indicate that the International Criminal Court closed file “Abdallah al-Senussi Sev al-Aslamu” because it does not have to represent the Libyan state; and automatically dropped the names from the list from the ‘international prosecution of Interpol’. “Information” is the first of its kind, but it has already raised controversy, leaving deep skepticism among experts. Possible that there is a secret behind former French President Nicolas Sarkozy’s decision to intervene militarily in March 2011 against the GREAT JAMAHIRIYA: the punishment imposed upon Mu’ammar al-Qathafi, who designed to launch the African currency (to replace the franc CFA), and thus it was threatening the French influence. Telecom is just one of the information contained in the messages sent in the spring of 2011 Sidney Blumenthal to Secretary of State Hillary Clinton that time used this former press adviser in an unofficial to her. This “information” about the hidden springs to Paris in Libya is another in a series of e-mail messages, which was unveiled late December as part of what was known scandal “Emile Gate” scandal-mail or emails to Hillary Clinton. The message dating back to light in April 2011 when the North Atlantic strikes against the Libyan regime began Pact. And it indicates the presence of a stock of gold (143 tons) and silver (143 tons also) – worth about 6.51€ billion -, accumulated by auspices of the GREAT JAMAHIRIYA, in order to launch al-Qathafi’s dream-project for an African currency. It was in late March, which is six weeks from the beginning of the Libyan uprising after, to send these goods to Sabha in the south-west. to restore France’s place among the Arab peoples “after slips by Michele Alliot-Marie in Tunisia”. Libyan artist Mohamed Hassan has a new longing 2016.
al-Anbh leader Ba Khoi Mutasim reputation for last. al-Ash (WESTERN REGION) demonstrations taking place in regions, and Ztun (NAFUSA) and Beautiful City (WESTERN REGION) in order to activate the ‘General Amnesty Law’. Inspection campaign and the spread of Melcaat at the entrances and exits of Tripoli. ‘Nawasi militia force’ (led by ABDUL RAOUF CARTE) of dozens of Libyan families in Tripoli to cancel the joys of their daughters for having a lock tell-tale ‘Mosque Alsqa lounge’ and why ..
Kidnapping ‘Mamed Amran Mamed Hlgom’, a student at the ‘Faculty of Economics’. Unidentified gunmen targeted ‘Ali al-Hamdi’ mafia-style with a hail of bullets, outside his home, in the area ‘Sabriyah’ which killed him. Shooting and sound of shooting in front of the ‘corner Street Hospital’. The arrival of the Prince of the Daash terrorist organization into Tripoli. He is a person of Palestinian citizenship, claiming the name again of “Abu Obeida”; and he is currently in school at Bosa-Limo-Gariba. He will give orders to start his phony call of Tripoli ‘Jihadi operations’, in order to declare ‘The Tripoli Declaration Emirate’ (of which he will coordinate as laison, between him and the Inventory of Gianni Gneoh Alkkla /el-Mahdi Haratine), who gave him in ‘hospitality’ a corse to enter Libya, and will provide a place for him and his ‘DAASH’ entourage, to be located mainly in Tripoli. A freak accident on the highway this morning between House Thamer area and city dome crossroads (at the pinworm specifically). The death of Sharif family of al-Furnaj area, resulting from the storage of gas cylinders. The blast, which was heard in downtown due to launch powerful fireworks in the Omar al-Mukhtar Street, and improperly traded the news about the car bomb or a bag of explosives. Cut power to several areas in Tripoli lasted for more than 3 hours. Found the body of a young man from Ghargharesh, ‘Abd Amalik Ohamd’, of the age of 18. His place of residence was in ‘Got al-Shall’. ‘Abd al-Mlk Ohamd Abdallah Qrbaj’ , was a 17-year-old. His body was lying on the side of the road in Gargaresh area. and a medical source confirmed from ‘Tripoli Medical Center’, that he was killed using white weapon (knife), digging on his chest phrase (Daash) using the tool sharp. The release of the citizen ‘Hasin Alloh al-Faragana’ of the city of Sirte, who was kidnapped on Thursday, from the center of the city of Tripoli. Stop the study at the Higher Institute of Medical Professions “Ibn Al-Nafees” as a result of deteriorating security. headless body foung in Ain Zara. Terrorist threats make it militias b Souk al-Jmah mobilize and activate the gate of the entrance area. Tripoli militia tremble with fear now, after threatening them by Amir of Daash Islamic-State terrorists in ‘Trabulus’ (TRIPOLI as they call it). Q categorize Twitter account in what he called an earthquake. The release of Dr. Mfattah al-Fragana, owner of ‘Hope Clinic’ of the area of Sal-Uh-Din after paying a ransom of 50 thousand dinars to his captors. Road and rail Dahra completely encircled by militias after the death of deterrence ‘Misurati Plumntqh’. The spread of intensive militias of deterrence in Dahra area. ‘Npil Mamed al-Buaha’ killed by Misurata Brotherhood militias stationed in the railroad’s headquarters in the (former) ‘Islamic Call Society’ building complex. They Launch Qadf Or Ba Ja in the air behind the Moulay Mohammed Mosque. 1. Samir Gammoudi of City CORNER. 2. Salem Madhoun of Jadu city (NAFUSA). 3. Mohammed Abu sound of Nalut city (NAFUSA). 4. Ashraf Baccouche from the city of Misurata (CENTRAL REGION). 5. Islam bulldozer from the city of Zuwarah (WESTERN REGION). Melcat Tripoli impose a curfew in the area al-Qrh Bolli. Beautiful demonstrations in activating the demands of the amnesty law and specifically directed toward our green prisoners. Asbi’a the beginning of the supervision of the starting point for the march on the application of the amnesty law and the launch of gathering all the green prisoners from detention centers. Asbi’a embarrass the supervision of the city in a demonstration for the release of green prisoners. Demonstrations in the beautiful condemning terrorism and calling for activating the amnesty law and the release of green prisoners. The closure of all banks in the city of Gharyan after receiving a threat to blow up the banks. Yes for the implementation of the ‘General Amnesty Law’. Yes for the return of the displaced. Large congestion within the City drawer because people throw shot by one of the sons of Zintan. A great tribute to all military, police and security men and young volunteers in the city of Zintan now in Albobat to secure the city in light of this cold and difficult weather ..
A great tribute to you and my Lord bless you and Araakm Aobtal Libya. ‘Zintan operations room’ a partagé la publication de ‘force supporting the security directorates of the western region and South Committee for the “200” ‘. ‘Directorates support the security of the western region and the southern power of the Commission, “the 200” ‘ a ajouté 10 nouvelles photos. ‘Directorates of security force support for the western and southern region’, HAVING the support of the ‘Military council of Zintan’, last night, began their campaign for detecting the violation of employment and counted. Village land of Zintan in the middle of the desert western mountain located west of the West Village about 45 km south of Mizdah about 157 km, and at the end of the navigation Ghadames from the east, located on a high hill in the head knoll Mnkorp angle in the rock, and the rooms for residential students of the Holy Qur’an. Where many books in a separate compartment. The task of teaching the Holy Qur’an corner of the village and pilgrimage destination of the population of the desert, along the corner of the room. Built building good, Not buried where Mr. Mohamed Azhari, a well-known and Zintan Ofadilhm scientists. If the place is fed Guest. And the inhabitants of this village of Zintan tribe, and some homes Mnkorp in stone at the foot of the knoll in her head and her story mentioned in the book (Sheikh Tahir angular) “Jihad heroes”. The new layer was built or what is known as popular in the early eighties on the right side of the valley opposite Steering angle, and the village hospital and clinic and a cultural center, a post office and the Faculty of Sharia and Law with the Western Mountain University; and a gas station in addition to the market complex “markets precedent” and a primary school and junior high school and high school and a mosque. Founder layer angle is Mr. Mohamed Azhari of Jeroh tribe of Zintan, did not come to al-Azhar, but the abundance of his knowledge nickname Mr. Mohammed Sanusi B.al-Ozahra; because, it was his contemporaries Vlzimh title, and it hits his knowledge. Proverb is said (world class), that he has taken the flag on Mr. Mohammed Bin impervious in the corner of the world, and he became the Fatwa on the mountain for a long time. God’s mercy, Azhari died about a year almost 1315 e.
There is the largest market for Tervas in Libya layer at all, the main market for Tervas red Hamada high-quality and distinctive taste. Where collectors truffles sell their harvest to the traders at the crossroads layer and which are distributed over the entire regions of Libya and even beyond. Delegation from the Sabha tribes ‘Qadhadhfa’ have gone up to Zintan. al-Rajaban youth meeting in support of ‘the Commission on the fight against crime’. The adoption of the ‘Federation of Youth al-Rajaban’, in a meeting of a large group of young people from al-Rajaban to support the ‘Fight Crime Committee’, which in turn are doing a great job for the fight against crime and drug dealers and hashish and ecstasy. Has also been gathring in a protest in the city of al-Azizia demanding the return of displaced persons and the release of green prisoners. ‘Khalid Abuamad’ fighter called the expulsion of ‘Mamed Mahasn’ platform of popular demonstration, which was organized today in al-Azizia on the application of the amnesty law and the launch of all the green prisoners from Libya. In today’s demonstration was including Maj. Gen.Amr Tntosh and fighter Khald Abuamad. Clashes path of coastal and cultural complex in the city of Surman. Killing “Abdallah al-Hzlol” and wounding eight others, in the clashes in the path of coastal city of Surman. Most shops shut down as a result of the clashes. On the background of madinah kidnapped sons of Sharari. ‘Room Zintan operations’ a ajouté 5 nouvelles photos. Visit wound terrorist bombing of Zliten ..
and has been providing the necessary treatment to them and the 36 of the number of wounded whom arrived to Tunisia . and Ntrahm Ali was martyred at the hands of the terrorist killers who invaded our country. as the year-gate, the western entrance to the city of Zliten is closed; and they are now closing gate Dafniya east of Zliten. ‘MUSICIAN’ explains: “OS (puppet) government was looking for legitimacy in tents solace in Zliten ! There has turned traitor to Ahamada sons in Zliten. Misurata militias were clashing with ‘the private convoy protection Sarraj district of al-Davnihotina’, as they were returning from the city of Zliten. The Western Puppet ‘Customers’ are besieged in the city of Zliten, where the OS has been shut . The news is Maaaaakd Misratah militias after asking for million, compared to the release of the OS. (Haya de own the band said on France). Security officers and other people walk next to damaged cars at the site where a truck bomb exploded at a security training camp on Thursday in the northwestern coastal city of Zliten, Libya. A truck bomb exploded Thursday at a security training camp in the western Libyan city of Zliten, killing dozens of people and injuring more than 100 others. The U.N. special representative to Libya, Martin Kobler, described the bombing as a suicide attack. It’s one of the deadliest attacks in Libya. Local and international news reports on the death toll varied, with some saying at least 47 people were killed and others putting the number at 65. “Hours after the blast, rescue crews at the scene had only managed to extract 60 bodies out of the wreckage, said a hospital spokesman, Moamar Kaddi. Libyan officials said they believed there might be dozens more dead,” The Associated Press says. Two nearby hospitals put out urgent requests for blood donations, Libya’s LANA news wire reports. Displaced policeman from the city of Sirte recognized Ai sleeper cells in the ‘Market Tuesday’ in B. Zliten. Found the body of a decapitated-man, in Sekka area, Mane of ‘Aan Zarh Ai’, as was written by the victim of ‘Abd Arahman al-Osea’ of Zliten. Dismantlisation of a car bomb, found in front of the ‘Faculty of Science’. Close the coastal road near the ‘Clinic al-Chuirv’ in City of Five. Anfhar a picture of the car bomb in the city of Misurata. Access ‘Mujahid Ahma Mamed Anbeh Aaboguenidh’ to the city of Bani Walid after being detained for two months by the militias of Daash, in the area of Nofaliya (by SIRTE). Yesterday was the release of the captive Mfattah Akaddava al-Kmiei after five years of captivity in the prison of ‘Misurata al-Cramah’. Dozens of protesters in front of ‘Libya company Municipality Branch al-Chuirv’, threatening to lock the industrial river system (GMMR) if they do not deliver Internet services for the region, within ten days. ‘Rabat mosque’ yesterday in Sirte, preaching one of the leaders of the ‘Daash’ terrorist organization, in a statement, said terrorism must be tyrants soldiers, according to the recipe, and threatening massive bombings inside the largest Libyan cities of Tripoli, and also Misurata and Zliten and City of Five. An ‘Armed convoy belonging to the terrorist organization Daash’ has come out of Sirte and is spreading down the south coastal road in ‘Buerat’ area, west of the city of Sirte (by 80 km). Today did not move any armed vehicle belonging to a terrorist organization of ‘Daash’ in Sirte and the organization did not establish any gate or immobilization in the three entrances to the city of Sirte East and West and South as usual and terrorists disappeared from the streets and closed the headquarters of the so-called calculation and doors as well as the headquarters of the so-called Islamic Court. Daash terrorist organization transferred its headquarters compound of the halls and into the Gulf of Sirte Acadouko complex for conferences and short-known hospitality and for fear of the bombing halls complex and Acadouko. LIBYAN AIRFORCE Warplanes bombed DAASH locations near the ‘Man-Made River Project’. Center bombing and thoroughly by LIBYAN AIRFORCE warplanes to SIRTE, where armed vehicles exist to regulate Daash terrorist bombed specific targets within the research complex adjacent rooms, Acadouko farm and loud explosions shake the region. And dozens of wounded and dead were taken to the ‘Ibn Sina hospital’ and a state of panic and fear dominate the present camps organization ‘Daash terrorist’ in the back west of Sirte area of ​​17 km and the evacuation of most of the individuals and armed mechanisms and moving south towards the valley of sweeping and arches and ambulatory. 4 LIBYAN AIRFORCE warplanes launched an attack on a DAASH research farm and the port of Sirte armed, and destroyed the place and the arrival of dead and wounded mechanisms to Ibn Sina Hospital and a state of chaos and confusion permeated Who’s hospital. A large spread of the elements in the vicinity of ‘Daash’ Ibn Sina Hospital and the establishment of the first 3 Astaagafat near the commercial bank and the second at the main gate of the hospital and the third in front of the entrance to the Faculty of Human Medicine. From research, this is a proven major farm operations used by the terrorist organization ‘Daash’, as a room link between them in Sirte, and to Bin Jawad . They used it as a communications center in the last attack on the oil ports, and also the second strike which hit the boats in the port of Sirte. ‘DAASH’ Sniper Abdallatif Ohamd Abdalhadi, nicknamed “Abu Anas immigrant” was exterminated by the young people of Sirte, after sunset prayers, in front of the sanatorium life. Spanish newspaper says that ‘NATO’ will bomb the oil ports if they are dominated by ‘Daash’. ‘Rouge Valley direct’ a ajouté 4 nouvelles photos. And “re-concentration in the oil fields”. South Eats her wanted area and patrolling large areas in case of any attack. A tribute to the heroes. ‘Daash’ terrorist organization published a report entitled: “raiding Crescent oil”. Among the dead organization ‘Daash’ during clashes last Thursday at ‘Port Sidra’, was a person who was working as an ‘Egyptian police officer’ ! He, Ahmed League, fought in the ranks of the terrorist organization ‘Daash’ and ‘Ahmed League’ had published (within the organization ‘Daash’) as his nickname being called “Aboumaaz al-Qrani”. There were 19 tanks in Port Sidra. 9 have been burned by Misurata and 6 have been burned by DAASH state regulation of … Who burn the remaining 4? Moment of engagement with Khorrgih in Port Sidra one axis and Black Guard Oil- installations Chlait DAASH ..
Arrested Inventory Ali al-Rajeha, reporter, and ‘Guenah al-Lenbh fountain’ in the oil field. Section exposure to attack from a group of outlaws have been stopped by the grace of God ..owalsbb attempt to take out a people of their right to set the order of the Parquet ..hat fled with their vehicles .. There is no truth to the news which is trading about dependency of ‘Battalion 204′ or ‘Thunderbolt Special Forces’. But these entities provided support sent Guo support us ..
autam custom al-Mthbn and will take legal action against them from being a deterrent !!!! ..ostqam state law, thanks to its youth stalagmite ..
ma I saw today heartened my chest where ‘all devices are united to defend the legitimacy of the state’ (TOBRUK). Thanks, appreciation and respect for ‘all units of the Armed Forces and Security Services and Room Protection Zones, and military intelligence, and even our Green, which stood for the protection of section (CYRENAICA). .nsol Allah safety for all. Safety teams were able to take full control of the fire in the tanks at Port Sidra and was completely put out the fire. Fully fire control in the oil tanks in Port Sidra and al-Phippa Greetings and great for all firefighters. ‘Black Libyan resistance’ a ajouté 4 nouvelles photos. Allah bless the Champions firefighters at ‘Port Sidra‘; and ask Allah for their healing and Anhieddi including national. reconnaissance aircraft flew in the skies of the city of Ras Lanauf. Toddler ‘Mamed Zwaoa’ who at the age of a year and a half and was wounded in the bombing today to support ‘the gate at Ras Lanauf’, remains still in serious condition. And Open a new page and Smhoa Brega illuminating Bahlha ..
Angulw two young people in the news and media differently from the rest of the pages. ‘Valley Rouge Directly’ a ajouté 2 nouvelles photos. RAZEK was the person on the last ‘municipal council member Surman and rebels of Tripoli’. Razek has a big role in coordination with the ‘Dean of the municipality of Brega’ regarding the transfer of the wounded to the outside, and will provide all the possibilities for the wounded. and the displacement of some families to Ajdabiya, Brega and Benghazi. Terrorist elements belonging to the ‘terrorist organization of Daash’ are assessing the gates in different places in the coastal road from Brega even Ajdabiya. Re-opening of the Port ‘Thuhayba’ balance in front of passengers after the protests in the back had stopped ‘Thuhayba’. The conduct of a terrible accident on the road to Brega, in Ajdabiya, which claimed the lives of four people (two women and two men). Directed by ‘number 70 displaced families from the city of Tawergha ‘live in the municipality of Ajdabiya in al-Guenan area. The military has declared the region a military zone. Ajdabiya controlled border guards on the gate 60, which was under the control of al-Mqji ‘DAASH’, which now have been thoroughly expelled from the gate. Strong explosion rocks the al-Gulwz neighborhood in Ajdabiya within the ‘Abu Bakr Siddiq Mosque’. Libyan Airforce Warplanes targeted morning separate locations for militias ‘Daash terrorist’ in Ajdabiya. Review of ‘DAASH’ in the city of Ajdabiya. A mortar shell fell near the Libyan hospital. A German family was near and combusted inside their car as a result of the fall of the shells. Child Abdallah Arisa (a 15-year-old) pictured with a news channel reporter called‘Ali al-Rajeha’ (who was trained in DAASH camps by Sabratha Melcaat fighters)…both were killed a week ago in clashes with the LIBYAN ARMY forces under General Hftar, in Benghazi. 1__ targeting Solomon al-Dharat stadium where the match is being held for ‘The National Union’. 2__guetly and wounded after mortar rounds on the camp’s displaced Tawergha sports city in Garyounes. Targeting a power station in Buhedama north of Benghazi with ‘DAASH’ missiles this morning, which led to power cuts for several areas. Fire put out in a power plant reservoir north of Benghazi. Sunday morning found the body of policeman ‘Mamed Ali al-Choudy’ burned at power station N° 71 in Buhedama. One combustion fuel tanks steam station in the city of Derna. The death of ‘Mny Agheita’, a member of the ‘MAJLIS al-Nuwaab’ for the dome after traffic accident. ‘Rouge Valley direct’ a ajouté 3 nouvelles photos. Stealing Libya’s gold in the south of Cyrenaica, by Soadin Ali Nigerian Chadian ,, ,, ,, Egyptian Hraamah open in its limitless is not a sovereign !!! and the ‘Commission communication’ and ‘Social Council of tribes Warfalla’. Patrol in front of a militia ‘skill Hotel’ fire on tribal-Atnan sons Qadhadhfa, which led to the diagnosed and subjected the car to the accident. Find a newborn baby lying in front of a garden Mrkzsabha medical school in exchange for immortality. Gunmen have killed the citizen Mamed Hassan al-Orvla, and wounding Hatm Khalifh Achtaoa al-Orvla, in the new area. Radio in Cameroon says Maj. Khamis is definitely alive: This is not tampering with Shi. It will be not much longer until we understand our place; and who initially leaked the news, and why it chose to be in Cameroon particularly ? READ BETTER THE ‘GREEN BOOK’ for a better explanation ! The GPC secretariat and the cabinet secretaries were appointed by the GPC secretary general and confirmed by the annual GPC convention. These cabinet secretaries were responsible for the routine operation of their ministries. If the guest was ‘speaking on the subject of men’, Mu’ammar al-Qathafi would immediately see the futility of ‘talking’,…so Mu’ammar would ask his guest if they would desire a cup of green mint Shahi, or, he would ask for permission to pray, or he would start recalling about an incident remembered from ten years ago. Italian General Paolo Serra become the commanding general (undeclared) as it was Bernard Levy (Speaker) undeclared at the beginning of February the catastrophe. He will organize the forces involved and put plans in cooperation with the international forces. It turns public opinion of the discussion of the illegality of his existence and violation of the rule to follow his movements and operations against ‘Daash’ legitimacy and become inclusive, cooperation and participation with a national duty. Limited operations will be in effect but will be presented in the media on being impressive victories and edit regions, followed by Western statements that the fight against terrorism needs a long time and information centers and exploitation of the existing air bases by Western forces. Also to become a foregone conclusion occupation amid busy people to follow up the news that fooling them from time to time strikes blow for terrorism and reap some of the heads of their leaders. Thus protectorate become acceptable and even welcome because they will participate in the news pass victories. International forces have become acceptable because they lead the fight against ‘Daash’ as so cheers false Western and Arabic ‘media’. Due militias are all the rear seats Jalili so-called army and its leadership unable to achieve anything noteworthy. And it is reclassified and integrate them within the legitimate Mardi official forces. And fools rejoice ‘liberalization of Daash’ to put another Western occupier place without feeling. Which began at the request of NATO intervention and legitimize the end to work under his leadership and his orders. For your information even claim what has been done editing gray coordination and leadership and US air cover. And the acceptance of the (so-called) ‘governance’ of Italian Major general Paolo Sarra. The children of Sheikh Abdul Salam Asmar a partagé la vidéo de green- Pen Green Pen. la Page on 25 novembre 2015 · criminal HiSam bin Humaid recognized in 2012 on the capital program Ozba channel where he said, and I quote ….. The children of Sheikh Abdul Salam Asmar a partagé la vidéo de Gaballa Ali. Hebrew NATO countries are all bombarded Libya for 8 consecutive months and eluted honest with themselves for the day greeting to the Libyans and the real shame of the goats NATO. DO NOT LET EVIL CLIENT ‘DAASH’ FOOL YOU ! This is an audio recording of the (so-called) “good” al-Krama Daash make a protest, in which is falsely propagandised as a description of the ‘organization Daash arrows’. Close ‘Thuhayba crossing’ by Tunisian protestors, and a Libyan citizen was killed after an altercation with the protesters. The closure of the road leading to Thuhayba offset crossing. Invitee ‘Khalifh al-Gal Health complex’ in area of Badri. Our Commander Mu’ammar al-Qathafi originally opened this 30 years ago. It is where Dr. al-Baghdadi Mahmudi practiced obstectrics. This boy was studying in the third grade Preparatory and was one frequented mosques Tripoli met him suspicious group and the wash his brain and sent immediately to the people of Sirte and did not know the boy, but Bshi paper written where I’m going for jihad for Allah’s sake’ !!! ..
And that’s before you now: before the bombing he had filmed himself in the gate in Sidra today in the ‘oil Crescent’. Shortly before BMB armored vehicles bound for the region of al-Furnaj belonging to ‘militias Dra DAASH’. A convoy belonging to the ‘armed militias of Misurata number 200 car crosses ‘Got al-Raman’ towards Tripoli. Gneoh militias kidnap angle hospital director ‘Mokhtar al-Hbas’, the Controller of ‘al-Faragana al-Tarhouni’. al-Qilos one of Melcaat Gneoh militia-people, was killed in clashes with Brotherhood militias in the area of ‘Obo azam Khlav’. Abdul Rauf hater Carte’s Nawasi militia attack on the MISURATA Brotherhood militia uniformity in the al-Furnaj area. Clashes in all of Abu Salim, al-Furnaj and Ada-al-Drabie. Kopri al-Hdid, Kopri lbraiqh, and Kopri al-Frusah. School artillery explosion inside the Airport Road. Power outages for several areas of the capital Tripoli and the return of congestion at petrol stations. Open coastal road link between the corner and Rishvana. between ‘Abdel Moneim’ and ‘Mohammed Badi’. The pain and deceit and deception ………. ‘Abdel Moneim’, not Kabbajh, who have millions .olm not have a father any position, but did not aspire to live like other young people. While (the son of Salah) ‘Mohammed Badi’, taught in Thailand and has a lots of money and (Mahbh) in. Abdel-Moneim was killed, and displaced people, and devastated his city. Mohammed’s father (SALAH BADI) came out and said were not meant Lee City ‘Abdel Moneim’ (of Kikla) ​​Shi, as he did not even bother to stand up for the people displaced, after Abdel Moneim was killed. While still studying, Mohammed (who was banded safely out of Libya) was not hurt in any harm. And that Allah in this story, is a lesson for those who wanted to be considered, when we are fighting a proxy war. ‘Directorates support the security of the western region and southern power’ play wide campaign to arrest the extremists within the Zintan mountain and we hope to cooperate with them and inform them about any who are suspicious. ‘Zintan operations room’ a partagé la publication de Zintan Salafist channel. Found an unidentified dead body of a dead and bearing signs of torture, at the Faculty of Science Alfrekh West in AJEELAT. The assassination of the young ‘Asamh Radwan al-Sgar’ from the city of Sabratha. He was found dead today in his car in the city of AJEELAT. And news about the presence of 6 dead and wounded. Death to ‘Saleh Jamil al-Taorga al-Qoha’, a condominium resident within the dark prisons in Misurata. According to the information he had died two years ago; but his uninformed family did not know of the news until today ! Interruption of all connections from the city of BANI WALID ! Many of the dead and wounded after a truck bomb attack on the headquarters of Acharth al-Askarah in Zliten. (Poti Ras Arrupe with fuel tank) appears to have been carrying a very large amount of explosives. There, in Zliten’s ‘Market Tuesday’, at the coastal road Legion camp, where one was preparing to produce a batch of new students, (the assembly date for students in the headquarters at about 7:30). The car on the truck entered the camp strongly at 8:30, only to explode inside the camp, in the presence of the students .. The explosion was very strong, to the point Astiqd his voice on the bulk of our people in Zliten. Said ‘Ahadd-al-Qatunain’ (just 2 kilometers from the incident) that he woke up with the sound of a huge bang, which opened windows of his house, having broken the windows of most of them. And eyewitnesses say that the fire was burning in Ahiot reinforced concrete exterior walls of nearby houses .. The voices of screaming women everywhere in Zliten. The voices calling for Bdharort blood donation in ‘Zliten Hospital’ .. The news that the number of expected deaths may exceed the 150 deaths ..
Material and human losses too large .. The coastal road is closed, and some nearby schools stopped today. There is a state of terror and fear and panic prevailing in Zliten‘s place. God bless the victims of explosion B.Zliten ..
To know each rat, and less than a stray dog, and every boy fiddling or deluded him, that of giving coordinates for aircraft NATO crusader infidel order aimed Bhmmha against our people unarmed civilians in Zliten malice and Guelleh ..
vlielm he sits is and from the day the crime of bombing training center Police truck bomb to fall more than 150 innocent human being, both in offense alike. To remember all words of leader Muammar al-Qathafi (Libya lipo turn to Islamic emirate …), but prevented Devils between you and wisdom at the time. Now supposed to understand all the pro-Nakba February dirty and al-Mcwmp, why chose the masses of February of lice and rats and tricked him with the attack on police and security centers and military headquarters ?? And remember the famous wisdom “but end up eating bull” and Qaysoha to say Martyr “Kdtendmon day to Ainf remorse,” and the curse of the Great God Almighty, on each of the Khan. Allah bless the victims of this terrorist act cowardly and inspired their families patience and fortitude, and God Ali mal case and helplessness. Allah is enough, and grace, and hell to the Agent (SATAN) in all those who contributed to the catastrophe in ’17 February’. User al-Mute in ‘Zliten Hospital’. The children of Sheikh Abdul Salam Asmar a ajouté 3 nouvelles photos. and now according to confidential information and accurate that there are lists prepared by al-Tndeim include 740 security men in various departments of the murdered between – Zliten – five 000 all Liberal discernible caution and steep and stay away from communities within cities Haliaaaaa this topic – I hope deployment of up to all the honorable and God Shahid Ali Maacol. people and families of the city ‘expelled’ ! reporter news channel owned by Abdelhakim Belhadj Amir of ‘Libyan Fighting Group’ is accusing the city of backing terrorists and attempting to cover them through their news reporting. The ‘Zintan and Red Crescent relief center’ are delivering humanitarian aid medicines and medical supplies to the hospital in Zliten. ‘Daash’ songs and speeches blaring broadcast from ‘Daash’ terrorist organization glare across Amaath audio in Sirte since this morning, after their defeat and their failure to occupy the oil ports; and claim what he described as Bjend succession to fight the ‘apostate’ Muslims ‘who control the oil’ (they said). ‘Daash’ in Sirte during his lessons after sunset prayers vows to enter ‘PORT Sidra’ on Friday and threatens suicide attacks by 200 Angmasa ready to liberate the oil wells as he put it, ‘considering that oil belongs to all Muslims’, as their WAHHABI preacher preached in his last sermon…..
Daash terrorist organization besieged neighborhood N°2, and they are making thorough rigorous inspections of passing cars. Also, they are forcing public sector employees to attend (compulsory) daily ‘classes’ for their compound at ‘Qaat Oukadouko’, to attend (brainwash) what they called ‘Mhadh-Arhakaidah’, bearing full punishment upon any absentees. Calm hangs over the entire area of Port Sidra, but flames are still burning in the affected reservoirs. ‘Daash’ terrorist organization based in the outskirts of the ‘Valley Akahilh’ between Port Sidra and Bin Jawad have not withdrawn from the area completely. ‘Daash’ terrorist organization based B.al-Thacad (near the town of West Om al-Guendel of Bin Jawad); and the arrival of convoys of DAASH into Sirte who are preparing to go into Bin Jawad to fully take-over and control the town. Ooonaba indicate the fall of the city Bin Jawad which is now controlled by the ‘DAASH’ organization. BMB armored type belonging to the Kharijites have been targeted by the ‘Oil Guard facilities’ in the valley Akahilh. Sheep ‘DAASH’ tank captured by youth among the ‘Oil Installations Guards’ at Port SIDRA. .. Glory changer conditions …! How we were and how we’ve become …. Praise be to Allah weft national. …! 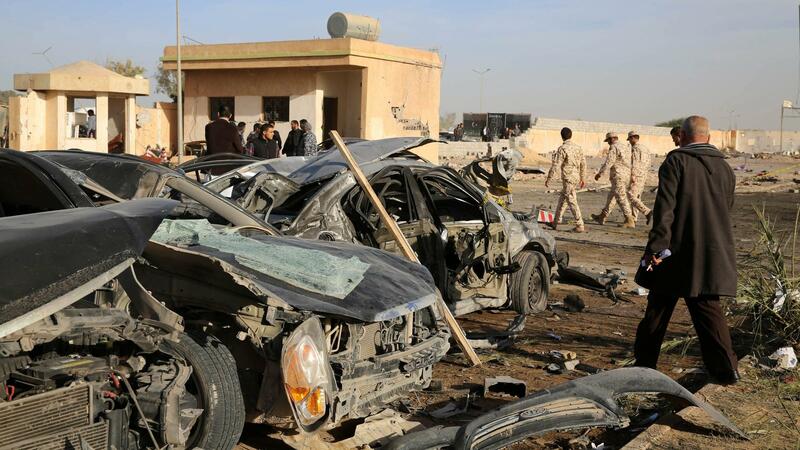 One of the car bombs that attacked by elements of the terrorist organization Daash Sidra on 01.04.2016 and was able to break into our ‘Champions Guard Oil Installations Central branch of Operations’, aborted and killed the terrorist, who was driving ..
‘Daash’ organization attacks the southwest Port Sidra forces of the ‘Oil Gurad installations and support forces’ Services of the Libyan Army, (under Ibrahim al-Jdharan). ‘Daash’ organization fell from their ‘Ada Kahilh’ posts; and full control has been restored by the ‘Guard Oil Installations’ Service Division of the LIBYAN ARMY. Brother martyr Saleh Mzkor ordered King Idris missile battalion. Fire in another tank of Alphippa company reservoirs east of Ras Lanauf as a result of bad weather and south winds estimated the amount of crude oil found in the Sidra tanks and Harouj by 7 million barrels approximate million Libyan dinars. Unfortunately wind cause the ignition of more Alphippa tanks in the reservoirs of ‘Ras Lanauf’. ‘Ibrahim Saqer’, Injured in yesterday’s terrorist bombing of the Ras Lanauf gate. Now assign ‘a convoy of Tobruk’ to arrive at Port Sidra, to join the rest of the ‘Saraya Guard facilities’ in assigning axes. and upon delivery of the bill for the dealer refused to receipt of the invoice and Free gave Allah scared him to the front of Sidra Parts good Allah and of and in pursuit of that material came to Ras Lanauf. Many families from the residential area at the exit Ras Lanauf heading to neighboring cities as a result of the explosion of the oil tanks. General Commander of the Army instructed the commander of the air base ‘HAVE-BUILT’, Colonel “Mohammed Mnfor” to move the company of pilots to ‘Ras Lanuf Airport’ to support the ‘Oil installations Guard forces’ in their war on terror. ‘Fathi Mustafa al-Megrahi’ from Ras Lanauf as he fought the Kharijites. flames bursting at Port Sidra tanks .. Please pray for these heroes this difficult ordeal that they do and that Anjeho in extinguishing the reservoirs after the fire that broke out in the tank V to Port Sidra. ‘Daash’ dead organizing terrorist elements who tried to infiltrate from the sea off the port of hand of PORT Sidra oil. Brave young Benghazi-boys stop men who tried to destroy the supply lines. Death in Benghazi axes when ‘DAASH Wajid Amoghair’ have supply line and then, most of the themes of media discreetly counterparty for who I Hajman Asudrh Kloha and Ahellbo even Ajifam Vthshm any talk. Inventory ‘Aasy bin Aasy’ (who ordered ‘prison Tmanh’) fell into a coma and is in fact at ‘the American Hospital (area of Chla in Turkey)’. The release of the citizen Ab Dakadir Abjad, after he was kidnapped about 8 months ago. Sudan opens its schools to Libyan students residing in Cairo (EGYPT), who are unable to pay the cost for their studies. WAHHABISM has destoyed our world ! Page identifiable developments in the case of Captain Hannibal Muammar Gaddafi, our brother who is detained in Lebanon… politically arbitrary arrests Antkiemaa violates all laws and all norms. By Attorney General Imad discriminatory Judge Kaplan. This call comes at the request of the International Criminal Court, which asked Lebanon to questioning. It mentions that a delegation from the International Criminal Court should have come to Lebanon, but Astmhl, because Lebanon is on the site of the ‘Rome Convention’ allows him and Gaddafi of failing to cooperate with the Court and the delegation not to approve the questioning. From here the court has resorted to the request of the public prosecutor discriminatory questioning Gaddafi on its behalf. It provides the legal mechanism used, the files included under Chapter VII of the Security Council, the cooperation of all Member States in the Security Council with requests Criminal Court, even if it were not a signatory to the ‘Rome Convention’. Allowed our brother captive hero Captain Hannibal telephone Ballowaldh need descriptive. Captain Hannibal Gaddafi is our brother. Suffering from strokes in his head because of the torture he endured during his abduction and detention. And suffering from injuries to his foot and is not treated so far and is being held in prison in solitary confinement in Beirut. And flimsy charges and fake because it does not punishable under Lebanese law originally …. O Ashraf Rifi ……. how much they give you, O Ashraf Rifi to continue what you are doing against Hannibal ?? By the Ministry of Justice in Tobruk who confirmed that Hannibal is not required to show-up for any charges, by full amnesty decreed in Tobruk a year ago in Libya. ask him to oversee the case and protect it from politicization and political interference. Lawyer ‘al-Bashir fishing’ (Captain Hannibal Muammar Gaddafi’s lawyer) warns of media incitement and fraud, and made-up fabrications resulting in dire consequences toward a person who is totally innocent. All the information has been fabricated. al-Bashir fishing says that The Safir newspaper,’Okaz’, and ‘Saudi Arabia’ must stop the dirty campaign of lies and demonisation against Hannibal Muammar Gaddafi and all the sons of the leader Mu’ammar al-Qathafi. was asked to personally intervene in demanding the immediate release of Hannibal Muammar Gaddafi. ‘Ahmed ulna’ is demanding that Lebanon immediately release Hannibal Gaddafi, who has been detained arbitrarily and unlawfully. And it’s nothing to do with the disappearance of martyr Musa al-Sadr. Mu’ammar al-Qathafi had nothing to do with Musa al-Sadr’s disappearance; because it happened outside the Libyan territories. All contrary news has been totally fabricated in this case. and the involvement of some of the media in this campaign falls within the framework of this propaganda aimed at demonizing the system of the GREAT JAMAHIRIYA (Third Universal Theory). In front of the Lebanese Embassy in London to demand the release of Hannibal Gaddafi and demanding freedom for Hannibal. The Lebanese people and the Lebanese government for the immediate release of the captured Hannibal Gaddafi. And a demonstration in front of the British Prime Minister to demand freedom for all detainees in the prisons of darkness Jermana, considering their opposition to the terrorist organization ‘Daash’ in Libya, foreign intervention in Libya, militias and armed criminal al-Fberarah in Libya. Hama, why you hate the whole of Hannibal and the leader Muammar Gaddafi ?? O means you Ashraf Rifi Shaw _khask ?? And Lech Kbernha to the cause of Hannibal, yet you continued to arrest him and turned to the issue of out of the blue? Henw reason your right to us, O, O Ashraf Rifi ?? These are not Azumh demonstration? Shooting voices heard near the bridge Gargharesh against the backdrop of the kidnapping of a woman. Image does not need to suspend the status of women days the Libyan Al-Tagah O Jardan. 1___ abduction of a woman named 10 in Slamh Mamed Saleh al-Haka street in GOT al-SHALL. Photos to intercept the plane by an armed group from Tajourah was a departure from the base to the airport Mitigua headed for Alexandria under the pretext that on the plane wanted people amid the screams of women and children. An armed group from Tajourah prevent passenger plane was heading from the MITIGUA airport to Alexandria, Egypt, under the pretext of the existence of wanted Alleha.mna plane. It came against the backdrop of the death of one of the leaders of armed groups in Tajourah. Anasser-melcaat picture of deterrence B.el-kd. It is based on the so-called Gamal Zoubih. Jamal Zoubih arrest called Mitigua Airport on the back of his expulsion of UN envoy Martn Kòbler of the press conference and on the air. “Torn homeland of the claim that they are surviving collar Vidjalo Charfah of strangers in their homeland and his side and was of mixed yesterday, with the near hypocritical with the right of fancy vanities come out of Khalthm al-Lantna al-Khiana and contaminate the country for as long as it was supervised al-Aotun have changed and honor. Despite of this, and more remains to this beloved homeland sons Brar will not Atakhlu him and that neighbor them from the companion. ‘Directorates support the security of the western region and the southern power of the Commission, “the 200” ‘ a ajouté 3 nouvelles photos. Malclha car delivery to the citizen (Faisal Busayri) type Hyundai stolen from him in 2014 on Tripoli airport road. ‘Mamed al-Sgar al-Lf’, and ‘Mamed do al-Jtilaoy’. Their families were contacted to ask for a sum of money in exchange for their release. The killing of the young man ‘Abd-Rlrozk al-Saleck’ at ‘B.triv Shat’. He was born in 1998, and killed at the hands of a single drug user(who stabbed with a knife in the heart). Voices heard clashes area al-Frekh b at Ajeelat. Young ‘Mamed Bashir al-Tricka’ of condition steady, wounded by gunfire from an armed group fireing at his head, trying to steal his car. ‘Social Council of tribes of the Warfalla’ denies what was cited on the lying channel news (WESTERN PROPAGANDA STATION) about some members of the council meeting with the (so-called) puppet ‘government of OS’. Anonymous flight hovering in the sky of the city of Sirte. Access afternoon truck cars to the city of Sirte and the type cars Toyota double under the protection of elements of the terrorist organization ‘Daash’. The organization of the work of the terrorist ‘Daash’, constructing earth mounds in the 50 area west of the city of Sirte. Elements ‘Daash’ terrorist organization Bastiagaf the people who walked in the gate 20. ‘Daash’ terrorist organization resides in the forty gate area west of the city of Sirte and thorough inspection of the car flying from Sirte. Dead and wounded from the elements of the terrorist organization of ‘Daash’ arrive to Ibn Sina hospital in Sirte. ‘Battle of Abu al-Qahtan’i changing the name chosen by the organization ‘Daash’ from ‘the Battle of Sidra’ .. ‘Daash’ Qahtani’ was targeted in a US raid in Derna. Withdrawal of ‘Daash’ to Bin Jawad’, after the robbery control. There came armed convoy to Melcaat ‘Daash’ terrorist of the city of Sirte which consists of cars and armed fighters heading to the town of Bin Jawad. Daash” terrorist organization assesses the gates and many Astaagafat along the coastal road from the city of Sirte all the ways until reaching Bin Jawad. Lying Agency within the depths of the media wing of the terrorist organization ‘Daash’ published pictures of the regulation on the control of the southern oil port of tanks at Port Sidra east of the city of Bin Jawad. Photos published by the Tnzbm of ‘Daash terrorists’ of the Port Sidra area across from Bin Jawad today. Pictures of tanks and warehouses of Port Sidra confirm the arrival of her Daash and non-specific, as ‘DAASH’ were found inside the tank installations ! Withdrawal of “DAASH” from Valley Akahilh, after violent clashes in the Port Sidra area since the early morning hours ..
Where were the families of the seven members of their ingredients ? .. and sheep to him and killed nearly 5 members of them ..
4 Wounded, Hhdan battles today in clashes ‘Valley Akahilh’ due to regulation ‘Daash’ at Bin Jawad, as well as the strength of assigning Eats her wanted me up ‘Ras Lanuf’ after they combed the areas surrounding the oil-fields and spread the axis of fighting B.al-Sidra. Ayeyieyeier Yadin Prophet A sweet victory to de Dink Yashik Hahhahahaha. We ask Allah for steadiness’s ‘Champions Guard facilities’. List Establishments of ‘Oil guards Installaions’ Servicemen who were wounded today in clashes at Port Sidra. And renewed clashes this morning after an attack by ‘Daash Ali’ at Sidra. And the fall of three martyrs and 12 wounded in the fighting today. B clashes Valley ploy between enterprises Policemen and organization of ‘Daash’. Alhbk gate of Sidra in the morning. . Penthro at the refinery before do not connect the Rafale and Apache. .. Bihrkona, Bihrkona oil. A large convoy of ‘DAASH’ is approaching ‘Ras Lanuf’ and destination seemingly towards Port Sidra .. Certificate visible presence of a burning car belonging to the point of camp of ‘Daash’ poll. Daash forces were advancing towards the Port of Sidra. Two Satro and Souro from here. Their faces al-Hfalla from here Htaiwhm ..
Ras Lanauf road closed due to clashes. Two men injured of the ‘guard installations’ remains fierce clashes. Processing a large force of secret Eats her wanted militant supporters and young people to go in the morning to Ras Lanuf. Currently intensify reconnaissance patrols of the area stretching from oil fields south to the coastal areas in the north to ensure they are free of ‘DAASH’. Aviation who hit today in the ‘Italian Sidra flight after the staff of the Italian company Veba’. Alaitalh authorities to address their fear of ‘Daash’ poured water from the control of the company, and held persona hostage. And accumulated Tsedko tails and horns who Icolo flight Misurata. A protest from our brothers Tabou, in-front of the ‘MAJLIS al-Nuwaab’ in the ‘White Hall’ of the founding committee drafting the (so-called) ‘constitution’ for the headquarters of a ‘just constitution’..the members forgetting the unanimous oath and declaration of 02 MARCH 1977; that, the Holy Qur’an is the only law of the land..
TGI Vhmuna how these are proof MISURATA is supplying ‘DAASH’. Was hit in ‘Daash’, el-Aish supports them in Benghazi, my shiny…. Elements of ‘Daash’ organization controls the villas adjacent to the 6-al-Hawari General Hospital. Video published of rat militia ‘Cil Chory of Bengazi’, showing their prisoners who follow the LIBYAN ARMY serving under Hftar. ‘Col – Awad Abu Faraj scaffold’ (above). Volunteer – Buhedama Ibrahim Mohammed Abdullah. Allah save ‘men guard installations’ in their war with ‘Daash’. Buhedama has been Tgiev 4 of Kharijites by ‘Champions Guard facilities’. Allah is alive and airmen Hawks from their day ! Thank Allah for the safety of Captain Naasralmbrok al-Haavy …, one of the new pilots in the Libyan air force ..
LIBYAN AIRFORCE Warplanes bombed terrorists’ positions within the areas of Laithi, Parwa and Rulrhh. Thnbugh is a mountain range located in the south-west of Libya, a barren plateau gravel rises more than 2000 m from the sea geology surface Thnbugh consists of a set of formations of volcanic rocks and exotic sandy shape and there are caves above the high plateau bordering the deep cliff in an area located by a large proportion of sand dunes Animated. The walls of these caves contain a range of exotic inscriptions that represent a full life of an ancient civilization. An analysis of these images Experts discovered that date back to 30 thousand years. There are large lakes to encourage fish life, crocodiles and hippopotamus. Fassad these favorable conditions prairie hunters and later herdsmen to build housing in the camps and various hills and fertile land of high desert. By 2500 BC, the desert, with the exception of the Nile River, has become barren land is no longer suitable that is inhabited by human beings. But this past remained fertile through drawings and inscriptions left by the population reflected on the rocks across parts of the desert. For those rocks beautiful graphics human forms become visible memorial to the beliefs and practices of ancient inhabitants of North Africa during periods of adaptation to the changing environment and to acquire new tools and habits. Simulator embodies the inscriptions on the stones of nature with large shapes of animals that have been extinct in that era, including antelopes, elephants, rhinos, giraffes, antelopes and hippopotamus. And there is hardly any of the ICON embodiment of pets, which may mean that the population may then earned a livelihood hunting large animals. The show forms of men armed with sticks, spears, axes and bows. This has occasionally published articles about the forgotten, the US-backed, brutal war in Yemen. and 24/7 and 21/8 “Yemen: brutal US-supported war kills children and creates svält”. “The international community” shows its ethical and moral level and illustrates its policy, by being mostly silent about the war – and above all by avoiding criticizing US involvement. This article of Medea Benjamin, demonstrates America’s deep commitment. I found it on the site ‘Code Pink’. While this is a necessary step towards ending violence which has killed thousands, crippled infrastructure and led to a critical humanitarian crisis, should peace talks includes a mechanism to rebuild the impoverished nation. Saudi Arabia, which is responsible for most of the destruction of its relentless bombings, should be forced to pay for the terrible damage has accomplished. So the US should do also. US involvement in Yemen can be summarized in three words: Support for Saudi Arabia. America’s problematic relationship with Saudi Arabia go all the way back to World War II, when US officials began to see the Saudi oil as a strategic advantage. Since then, the US had blindly supported the UK in almost all political and economic efforts, despite the fact that Saudi Arabia is an ultra-conservative Islamic monarchy with widespread and repeated violations of human rights. When the Houthis, an “Anasar-Allah” oriented ‘rebel’ group from northern Yemen, took the Yemeni capital Sanaa in January 2015 and the puppet-Sunni president Abdrabbuh Mansour Hadi on his own accord, resigned, to be in exile; But then formed in Saudi Arabia a coalition among the Arab Gulf states to fight the Houthi. Of course, the US has agreed to support these close allies in its efforts to “restore order” in Yemen by providing intelligence information, weapons and refueling of aircraft in the air. The US also sent US warships to enforce a blockade in the Gulf of Aden and the southern Arabian Sea. The blockade was ‘allegedly’ to prevent weapons shipments from Iran (BUT THEY HAVE SENT NO WEAPONRY !) to the Houthi, but it also prevented humanitarian transports to support besieged, confined Yemeni citizens. CIA and other military intelligence service is also in place in Yemen, and provides information about military targets, and logistical support. US drones fly constantly and sending intelligence information to the Saudis. Since then, the coalition carried out indiscriminate airstrikes and bombings across the country, often in densely populated civilian areas. In late September, the ‘UN documented’ that the war had killed 2,355 civilians and wounded 4862, most cases because of coalition air strikes. Saudi-led military intervention has created a humanitarian crisis where 75% of Yemen’s population (21 million people) is in urgent need of immediate assistance. Millions of people have been forced to leave their homes without water or electricity, as the country’s infrastructure continues to disintegrate. The US is the largest supplier of these weapons used to bomb Yemen. Cluster munitions, which are sold to Saudi Arabia by a US company called Textron, has been used in many of the coalition strikes. These dreadful bombs presents a particular danger to civilian populations because of its comprehensive power and the fact that unexploded bombs can remain dangerous for decades after they are released. Therefore, they are banned in more than 115 countries. “Saudi-led cluster bombs airstrikes have struck at areas near the villages, and putting the local population in danger,” said Steve Goose, arms director at ‘Human Rights Watch’. “These weapons should never be used under any circumstances. Saudi Arabia and other coalition members – and the supplier, USA – defies the global norm that rejects cluster munitions, because of their long-term threat to the civilian population “. To make matters worse, the terrible conditions on the ground led to a strengthening of extremist terrorist groups that will inevitably plague the nation for many years to come. The local al-Qaeda branch, is part of the ‘al-Qaeda in the Arabian Peninsula’ (also known as ‘AQAP’). Formed in 2009, it has used the current conflict to increased recruitment efforts. The current political and security gap has also paved the way for the emergence of a branch of ISIL that carried out deadly attacks on Shiite mosques and positioned itself as even more aggressively than ‘AQAP’. Some fear that “AQAP’s, and ISIL’s recruitment efforts” may lead to competition between the two radical groups, that can mean even more attacks around the country when the groups are trying to upstage each other. Saudi involvement in Yemen has only destroyed lives and created a state of total chaos, and the U.S. government is complicit in the carnage. Both nations should, as part of the peace process, forced to pay compensation for the enormous damage their bombs have inflicted. The coalition led by Saudi Arabia kills his mercenaries in Yemen once they complete their missions to prevent leakage of confidential military information. Since Saudi Arabia began its invasion in the Yemeni impoverished neighbor in late March 2015, coalition aircraft bombed led by more than twenty times the positions of their own mercenaries operating in Yemen. Riad argues that the attacks were carried out by mistake, but a secret report shows otherwise. “Saudi Arabia does not want the experience of defeat in Iraq, where Saudi terrorists and mercenaries committed crimes against civilians and recorded videos (of horrible scenes) and put them within reach of the world to repeat. In addition, the coalition led Saudi Arabia does not want to leak confidential military information “reported Friday correspondent of the Iranian news agency Fars in Sanaa, Yemen’s capital, citing several senior ‘Ansar-Allah’ popular movement. The text states that it is unlikely that the alliance mistakenly bomb the positions of their own mercenaries, when known exactly where these people are deployed. The last such incident took place on Thursday, when they killed at least 15 Saudi mercenaries in a fit of Saudi fighters in the city of Taiz, in southwestern Yemen. The attack occurred in the town of al-Shaqab, in the center of Taiz, wounded another 30 fighters. Saudi Arabia Yemen remains deployed in hundreds of mercenaries from Sudan, Somalia, Colombia and several other countries. There are reports showing that Riyadh pays a month to these people to participate in the attack on the devastated territory of Yemen. The accidental bombing mercenaries in Yemen Saudi Arabia contrast with the fact that it has not registered any attack “by mistake” alliance against terrorist positions there. Last July, the US newspaper The Washington Post reported that Saudi Arabia not only prevents attack in Yemen to Al-Qaeda in the Arabian Peninsula (AQAP), but Riyadh bombings have paved the way for the progress of this terrorist group. TODAY, the SAUDIIS executed SHI-ITES! Colombia criticized Saudi Arabia and the UAE for high earnerings which have seduced his soldiers to fight in Yemen while Bogotá needs their men to fight the insurgents and drug traffickers. “My complaint is that, for example, UAE (UAE) and Saudi Arabia have not been able to negotiate a treaty with Colombia to regulate this relationship,” said Minister of Defense of Colombia, Luis Carlos Villegas, as reported Thursday the American chain Bloomberg . In this context, a Colombian ex-military, who requested anonymity, he said that the soldiers are being persuaded to leave the Army of Colombia by economic incentives offered by Saudi Arabia and UAE, that is, winning nearly seven times what they receive in his country. Colombian Defense Minister Luis Carlos Villegas. A Colombian ex-soldier can earn per day in the Middle East compared to per month they receive in Colombia, while someone who has an official range and can speak English can get a salary of a day for fighting in that region according to the ex-oficial. He also estimated that there are about 2000 Colombians working hired by UAE and over 200 have been sent to Yemen to guard bases but so far such as affirmative have not engaged in war. Bloomberg said that neither the Saudis nor the UAE authorities have expressed willingness to discuss using Colombian soldiers and the possibility of reaching an agreement with the government about the South American country. The Bogota government has so far not received any information on Colombian citizens who have died in the fighting in Yemen, according to a senior official of the Colombian Foreign Ministry who asked not to be identified was not authorized to speak publicly. Recently, Yemeni sources have reported that at least six Colombian soldiers have been killed during clashes in the city of Taiz (southwest). Last October, the Colombian daily El Tiempo reported that at least 800 former members of the Colombian army entered Yemen to support the offensive of the Saudi regime and its allies. A residential building after being hit by an air strike in Sanaa, by Saudi aircraft (in Yemen). Moreover, UAE last November sent secretly to 450 mercenaries in Latin America , including Colombian soldiers to Yemen to fight in the service of the Saudis against the Yemeni Army. According to the latest United Nations statistics , the Saudi aggression against Yemen has left more than 32,000 victims, dead and wounded, mostly civilians. The ‘Yemeni Army’ backed by the ‘Popular Committees’ supporting the ‘Houthi Ansar-Allah’ movement has conducted a successful operation against Riyadh’s mercenaries in the southwestern province of Ta’izz. The regime in Riyadh began the campaign against Yemen on March 26, 2015. The airstrikes were meant to undermine Houthi. Also on Sunday, Saudi warplanes bombarded a number of areas in the Yemeni capital, Sana’a, including the al-Sabaha district. Saudi jets also targeted the districts of Haymah al-Kharijiyah and Hamdan in Sana’a. Local sources said the warplanes launched six airstrikes on Haymah al-Kharijiyah and two on Hamdan. More than 7,500 people have been killed and over 14,000 injured since the Saudi airstrikes began in late March; Press TV reported. A fighter Loyal to Saudi-Yankee Puppet-president Abdu Rabu Mansour Hadi. Saudi mercenaries attacked Sunday humanitarian trucks arriving to the city of Ta’izz, in southwestern Yemen. According to local News agency ‘Saba’, Saudi mercenaries and loyal to the Saudi-Yankee puppet-president (who voluntarily legally resigned) ‘Abdu Rabu Mansour Hadi’ forces, have erected barriers at the entrance of the city and attacked and robbed humanitarian aid to the inhabitants of the city of Taiz, which They are surrounded for months. Egyptian Security arrested Libyans in Cairo, under the pretext of the ‘absence of the establishment’. peace be on you all and the mercy of ALLAH …..